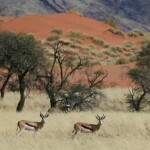 South of the salt pan lies the Namib Rand Nature Reserve. With approximately 170,000 hectares it is the largest private Nature Reserve in the region. The area was formerly home to farms in the area, which were bought out by the businessman J.A. Brückner from Windhoek in 1984. 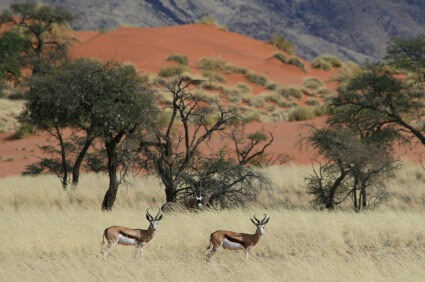 The nature reserve was developed in 1998 and now provides very exclusive accommodation to guests. After the farmers had ineffectively managed the region by overgrazing and intensive hunting to the brink of collapse, sustainable tourism helped create this little paradise. The reserve is now home to mountain zebra, giraffe, spotted hyena and bat-eared foxes and many other animals who roam the area freely. Currently they are considering reintroducing the rhino back into the area.